The bright green colour and the hard outlines of the mountains and clouds evoke Tang (618-906) dynasty landscape style. The perspective, in which there is no proper receding ground but in which the eye is led up the zig-zagging composition to the relatively large figures in the background, is also inspired by the Tang murals at Dunhuang. 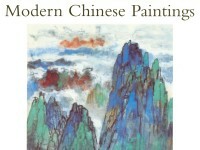 Zhang Daqian was one of the most successful painters of the 20th century, renowned for his skill and versatility. He produced many copies of Tang dynasty (618-906) murals following a visit to the famous Mogao Buddhist cave temples in Dunhuang. The bright green colour and the hard outlines of the mountains and clouds in this painting evoke the Tang landscape style. The use of perspective, which leads the eye up the zig-zagging composition to the figures at the top, is also inspired by Dunhuang murals.